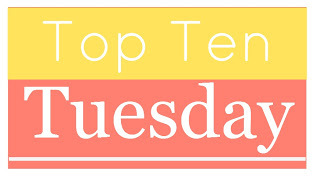 Tuesday's Top Ten: My 2013 Reading Goals ~ Love.Life.Read. Paula @ The Broke and Bookish is asking us this week what our Top Ten Bookish Goals are for this year. This lovely picture above is part of my closet in my office. Now it is not just books but craft supplies, journals and such. 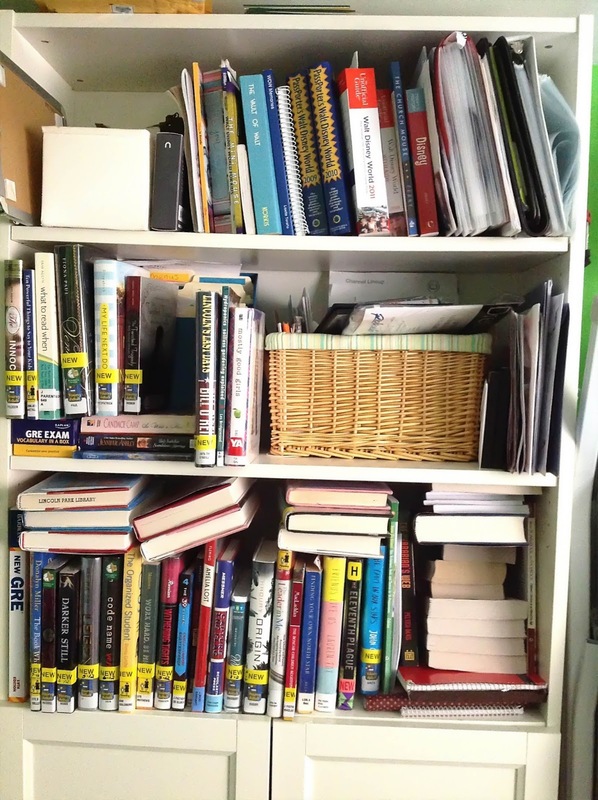 The bottom shelf in the picture is mainly are books I've kept from grad school to refer back to--which I admit I do do quite often, especially if I am working on a paper. The two other shelves that you see right there--full of books I owe whether I've bought them or have been given either as gifts or won. There is a small box under my desk (not pictured) of more books that need to make there way into my closet for safe keeping. The shelves shown on the right is my tall bookcase. Because I need to do some shifting, it is a little messier than usual but this is basically my landing zone for the library books I just have to bring home with me from work. The top shelf also is where I keep my Disney books. I did not show the shelves behind the doors but there are books in there—mainly the adult titles I have either bought or been given. I also have more journals in there. So as you can plainly see, I have enough books to last me for quite awhile. Those don’t even include the eBooks. :-) I am not as disorganized as what it looks. Things appear a little messy after my office got ransacked over the holiday season, prepping and wrapping presents in there. I shoved things aside and since I have been sick these last few weeks, I have not made a better effort to get it cleaned out. 3) To Be More Active in Writing Reviews. I read a decent amount each year but I have not been as active writing reviews. My goal this year is to review 50% of the books I read, if not higher. There are times when I just want to read or I get busy and do not sit down to write the review soon after finishing it. My sub goal of this is to write a review within 48 hours of finishing a book. Sometimes I need breathing space between the book and the review but then I get busy and distracted. I hope to be more aware of this year. 4) I Want to Branch Out in My Reading. Is anyone else like me and we get in our comfort zones reading the same genres, same authors, and the same_________? I want to try to push myself to read out of my comfort zone. Who knows, maybe I will discover a new to me author I love or a new genre of books to devour. 5) I Want to Read More Books than Last Year. Last year, according to my Goodreads profile, I read 153 books but in reality, I read more than that. I want to make sure I log every book I read in Goodreads this year. 6) I Want to Get Back into Writing Bibliographies/Reader’s Advisory tools. I have not had time at my current job but I want to make more of an effort to fit them in this year. It is one of the greatest tools I can use and I need to be more active in doing them again as the parents, children and teens always thank me profusely (not to mention the other librarians too). 7) Track the Amount of Pages I Read in a Year. Sometimes the number of books does not tell the whole story. :-) Simple goal, I just need to be tracking them so I know. I am using Avanti’s Challenge to keep the incentive going. 8) Catalog My Personal Library of Books. Yes, the complete geek in me is showing but I get a thrill out of it. I am a librarian and book lover after all. 9) I Want to Keep Listening to Audiobooks. I have not always been able to listen to audiobooks as I tone them out after awhile. I want to continue working on listening to audiobooks as I find it a completely different experience than reading it. For one, it takes more time! 10) Stay Up on My Reading Challenges. No one can accuse me of doing things half way. I have signed up for some many reading challenges but I have to admit—I restrained myself. There are several others I want to join. Who knows, maybe I will join them sometime into year if I finish some others I am already doing. Now, that I have shared my 2013 Bookish Goals, I want to read about your goals! Leave me a comment so I can visit your post. We have two goals in common: catalog and buy less. I'm the most excited about cataloging. It's geeky, but I'd really like to know exactly what I have. Yay! 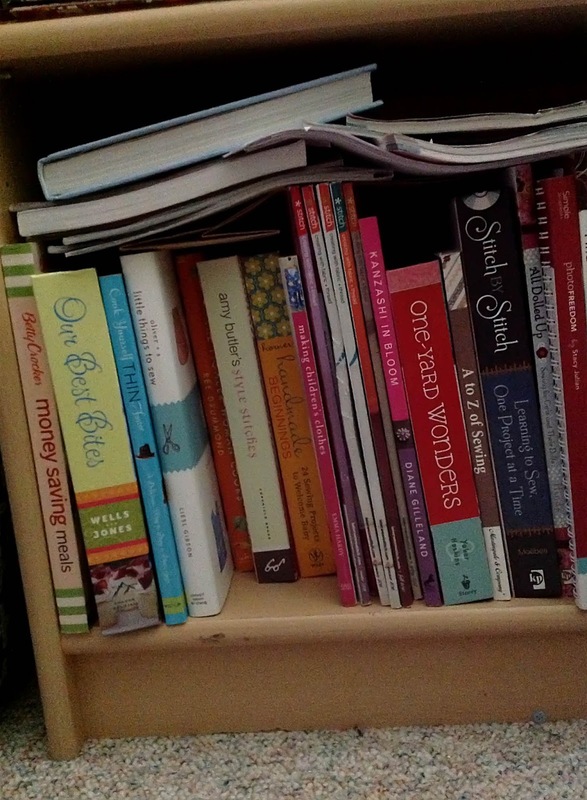 I am glad I'm not the only one with cataloging on my bookish goals this year. Happy Reading! Great list. Your shelves look a lot like mine. I've been thinking about cataloging my books but haven't gotten around to that yet, maybe that can be another reading project for me this year. 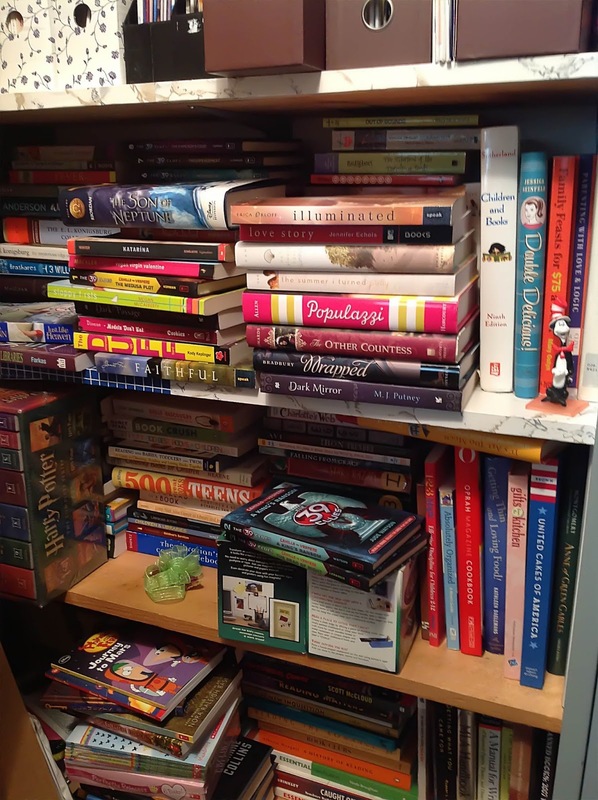 Cataloging our collections would make a great reading project this year. Wow, great list! One of my favorites! I want to listen to more audiobooks this year as well. Good luck! Awe, thank you! That is very kind of you to say. :) Good luck on your goals and Happy Reading! I think it would help greatly! I think with moving it will give me a fresh start and I am looking forward to it. :) Thanks for stopping by. Happy Reading! Oh man, I cataloged my books last weekend and it was a TASK. But so rewarding. I highly recommend it! Great list! I know what you mean about cutting back on book buying...but it's so hard! Especially when I go looking at places like Goodwill and Value Village, where they're super cheap! And to answer your questions, I sometimes write posts beforehand. It depends. Usually I do them the night they go up (I'm on PST, they go up on EST), but sometimes I'll go a day or two ahead, or if it's a review I'll write that once I finish the book. Hope that helps! Thanks for sharing and stopping by! I'm so very jealous of you're shelves haha. I wish I had that many books. Since moving out and having my daughter I've found it easier to download books to my kidle (only through lack of space at home). So I have't bought a actually paperback or hardbook I forever. I miss it tbh. Oh, I've taken quite a few years to build up all those books. LOL I am a book addict :) but at least it is a healthy addiction. I do use my e-reader quite often too, especially when I travel as I find it much more convenient. Thanks for popping over to visit me. :) Branching out is something I constantly struggle with but I really am trying to do better this year. Good luck on your goals and Happy Reading! I need to be much better about what I buy and reading what I buy as well. :) I'm glad I am not alone but the temptation is hard to resist. Happy Reading! I cannot remember have tracked pages before but I think it would be interesting to see how many pages I've read by the end of the year. :)Thanks for stopping by! Love these goals...especially about reviewing more of what you read! Most are on my resolution list this year as well! What a great list! Good luck closing on your house! Thanks! We are excited. :) I am looking forward to it and have been dreaming and scheming. Happy Reading! Let's Talk About It: Why I Blog? Why Do YOU Blog? Monday's What Are You Reading? CYBILS Top 5 Announced Today! !